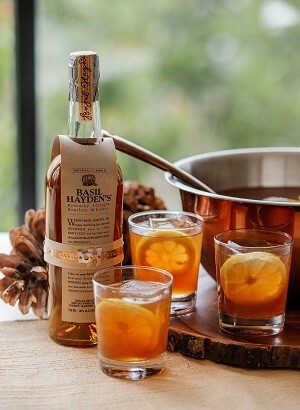 For those looking forward to traditional fall activities like bonfires, apple picking, and pumpkin carving, Basil Hayden’s Bourbon, Knob Creek, and Laphroaig Scotch Whiskey have something for any fall adventure. 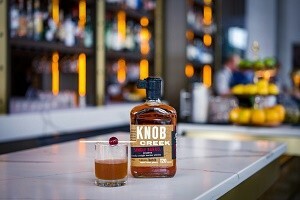 Whether you’re batching Basil Hayden’s Autumnal Punch for a group, sipping on a Knob Creek Bless Your Heart at dinner, or toasting the new season with a Laphroaig Needle In The Hay, these cocktails will warm up anyone’s fall day with their crisp and seasonal flavors. Peel lemon and grapefruits and add peels into sugar, let sit for 2 hours. Bring water to boil in a sauce pot, remove from heat and add earl grey tea, steep for 3 minutes. Add sugar mixture to tea and stir until sugar melts. Let cool. Remove peels. Juice lemons and grapefruits, combine with Basil Hayden Bourbon and Earl Grey Simple Syrup. Cover and refrigerate until cold. Serve in a small punch bowl with large ice cubes. Garnish with lemon wheels. Combine all ingredients in mixing glass and add ice. 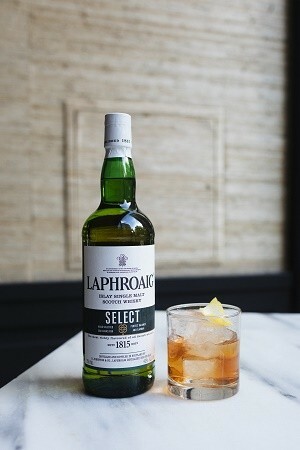 Stir and strain in a chilled coupe glass. Garnish with a skewer of Luxardo Maraschino cherries. Combine all ingredients in a cocktail shaker and stir until slightly chilled but still boozy. Strain into an old-fashioned glass with a large ice cube. Garnish with a lemon twist.